The story of Russell Collins – Artist about Town. With thanks to Paul Bryant. In 2012 Russell Collins was walking through a Craft Fayre in Milton Keynes where he saw an artist called Paul Bryant, painting. 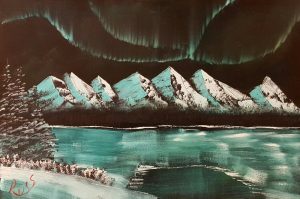 Paul Bryant turned a black 80cm x 40cm canvas into an Arctic night scene in 30 minutes, and sold it twice before he finished it. I thought that it looked so easy that I could do it, and it turned out that I was right – I could. My painting wasn’t as good as his, but it was my first painting in 40 years, and I thought it a masterpiece. Now, 3 years on I am teaching others how to paint. Paul told me about the Bob Ross method of painting, and in the middle of the crowded hall, he took me through the basics of it. He told me that he was holding a painting week on the following month. I went to one day of it and produced this. At the first opportunity I went to my local Hobbycraft and found the Bob Ross Master Paint set, and then I looked on-line. Having found it much cheaper on-line, I bought one and a few days later it arrived on my doorstep. That was the start of my new interest in life. The Bob Ross CRI Landscape course followed, and the CRI Floral course started. The Gary Jenkins Floral J-CAT courses in Germany followed as did the Gary Jenkins Masterclass. At the Masterclass I learnt how to paint fish (I was hooked), and birds (not at all foul). It was all very funny, because as we met on the Gary Jenkins course we started talking. 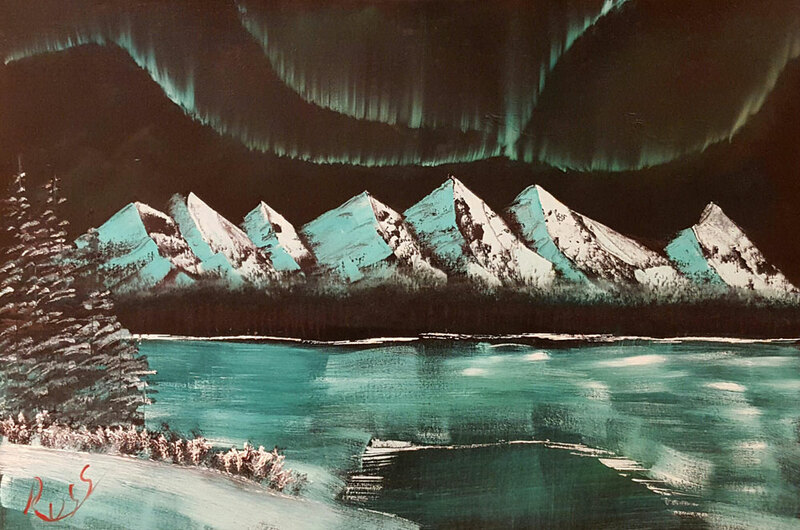 It turned out that we all started our painting the Bob Ross way. I started learning about how other painters worked – Jane Font of Paint with Jane fame. Lady in a red dress and a red umbrella walking alone through London. Jane introduced me to knife work, and thanks to her I have my biggest selling painting. I call it “The Lady In Red with Louboutin Shoes”, and it is based on her “Walk In The Rain” painting. Then Robert Hagan introduced me to an impressionist painting style that used a 1 inch pastry brush as the main brush. I am also a Valentus Independent Reseller selling products for weight control and fitness.